Full length protein, corresponding to amino acids 1-374 of Human SPOP (NP_001007227.1). SPOP transfected 293T cell lysate; HeLa cells. Our Abpromise guarantee covers the use of ab168619 in the following tested applications. WB Use a concentration of 1 µg/ml. Predicted molecular weight: 42 kDa. Inhibits IPF1/PDX1 transactivation of established target promoters, such as insulin, may be by recruiting a repressor complex (By similarity). In complex with CUL3, involved in ubiquitination of BMI1, H2AFY and DAXX, and probably also in ubiquitination and proteasomal degradation of Gli2 or Gli3. Belongs to the Tdpoz family. The MATH domain interacts with H2AFY and BMI1. 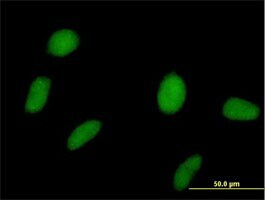 Immunofluorescent analysis of HeLa cells labeling SPOP with ab168619 at 10 µg/ml. ab168619 has not yet been referenced specifically in any publications. Publishing research using ab168619? Please let us know so that we can cite the reference in this datasheet. There are currently no Customer reviews or Questions for ab168619.